Daily Strength and Protection with organic Phyto Minerals and Zeolite. Prevent common health issues for a long happy life. Sourced only in the USA, ever. Because Dogs are family too! 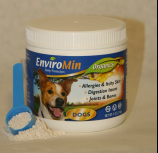 EnviroMin Dog with Phyto Minerals to strengthen the body and Zeolite to remove toxins. The modern canine diet is filled with chemical preservatives, fillers, additives, and questionable ingredients. Toxin overload and buildup in the body can lead to common issues such as allergies, itchy skin, diarrhea, and inflammation. 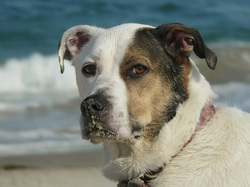 EnviroMin Dog provides a "Gently Daily Detox" to protect against these common issues. Our Phyto Minerals (from plants) fill in the dietary gaps for healthy digestion, immunity, joints, bones, coat, heart, energy, and longevity. EnviroMin Dog is easy to use, affordable, and works well with all types of dog food; Dry, canned, and raw food diets. Safe for puppies, pregnant females, weak dogs, and especially important for all senior dogs. "Dogs are family", so EnviroMin ingredients are always organic, human grade, triple tested, and sourced only in the USA. Guaranteed results or we refund your money with a smile! daily for long lasting results. Our many loyal customers asked for a large, money saving, refill size box! Now you can easily refill your jars from this refill box with a food grade liner, 1440 servings, a scoop, and complete serving instructions. Saves money and shipping costs for our "Multi-Dog Families", Rescue Shelters, Breeders, and you Really Big Dogs. Woof! Woof! Like us on Facebook and get a discount coupon! Send us your testimonial and we will send you a Free EnviroMin Dog! Send us a photo of your Fur Kids! 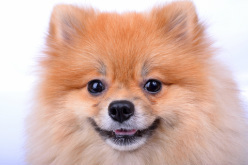 If we use it on the website we'll send you a Free EnviroMin Dog! Phytolithic Silicon; from fresh water phytoplankton, 70 naturally occurring trace minerals, natural Zeolite. Always organic, human grade quality, sourced in the USA. Tested for safety and purity by Independent Certified Labs. Why Is Phytolithic Silicon Vital? Send us a photo of your Fur Kids! If we use it on the website we'll send you a free EnviroMin Dog. Send us a photo along with your testimonial and we'll send you a free EnviroMin Dog.